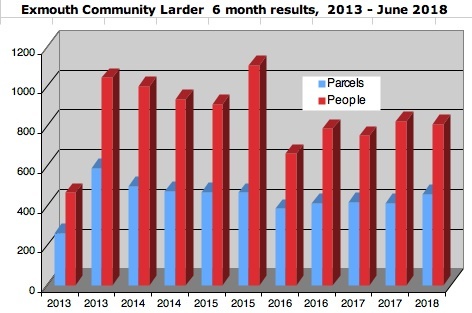 The graph below shows Larder usage in six month periods. While needs vary so much from month to month, the six month averages show that in general demand has been fairly steady. With so many variables, we are not clear why there are such monthly variations - nor for that matter why it should remain steady on average; we report the facts!! and 1.30pm-3pm on Fridays . . . . (including weeks when Monday is a bank holiday).